A cover letter template can be used as a guideline for those creating a cover letter. Many job seekers spend so much time preparing their resume that they don't have time to work on their cover letter, or forget to do so. However, the cover letter is just as important as the actual resume. If your cover letter is drab and doesn't grab the hiring official's attention, your resume may go straight to the trash can. You've got only one try to make a first impression, and it has to be a great one. Proper cover letter format can mean the difference between being hired and being ignored. Your cover letter is a form of advertising to market yourself to the employer. There are several things that should be included in a proper cover letter template to help you stand out from the crowd. The content of your cover letter should include three very important pieces of information: Why you are writing, what you have to offer to the company, and how and when you will follow up with the prospective employer. But the content of the letter is not the only thing you have to focus on - there are several other aspects of proper cover letter format that are very important. We've put together a list that can help you. First, you must make sure you use the proper cover letter format. Your cover letter should be written in 10- to 12-point font, single-spaced, with margins of 1-inch to 1.5-inch on all sides. A font too small will be difficult for the recipient to read, and a font too big will look unprofessional. Ensure you use the proper type of paper. You don't have to spend a fortune on paper, but choose a good, heavy paper. Cheap paper looks unprofessional. 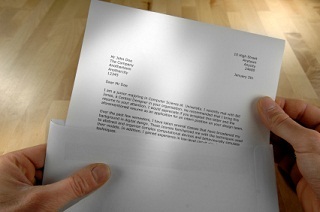 Your cover letter template should be that of a standard business letter. Include the proper salutation and closing, and add your address and date at the top of the cover letter like a typical business letter. Your first paragraph must let the employer know why you are writing. Don't just state the obvious, let them know the exact position you are applying for so there is no confusion. Also let the employer know where you saw the information about the job opening. The second paragraph should tell the employer what you bring to the table. Correlate your skills with the information in the job posting, and let the employer know how your experience and education will fulfill their needs. Finally, let the hiring official know when and how you plan to follow up, whether by phone, letter or email. Give a firm time frame and stick to it. At GoGetterCareers.com, our team of professionals can help you with all aspects of finding a new job, from finding jobs, to writing the resume and cover letter, preparing for the interview, and then following up after the interview. If you are struggling with writing the perfect cover letter, we can provide you with a cover letter sample, cover letter template or a Cover Letter Wizard to help you get started. Resume cover letters can be created using any of these options. For more information about how we can help you find a new job or a better job, contact us today!